The third and final day of Event 28, $2,500 No Limit Hold’em Four-Handed, of the World Series of Poker has come to an end. 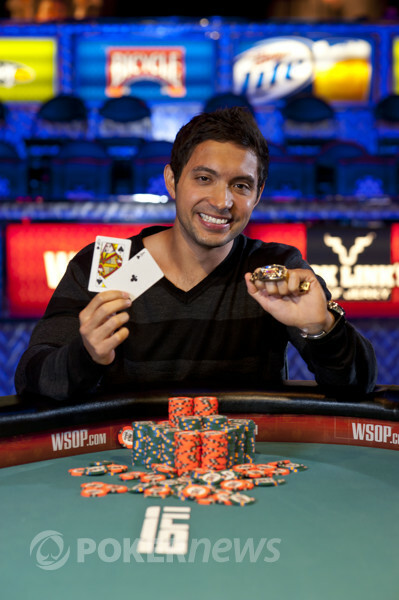 After returning with eight players only Timothy Adams walked away with $392,476 and his first WSOP gold bracelet. 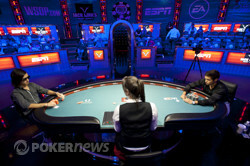 It took less than one full level to trim the field to five and move to the ESPN Feature Table in the Amazon Room. 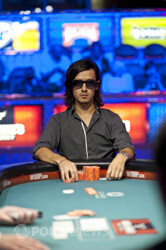 Andrey Gulyy, Toan Trinh and Torrey Reily were all short stacked and looked to double up. But their luck didn’t hold and they missed out on the final table. The players played about a level and a half before the next elimination would occur. Brendon Rubie opened for 33,000 and Greg Merson shoved behind him. Rubie called holding and Merson had . Rubie paired his queen on the turn and Merson never improved, sending him home in fifth place. Anthony Gregg had been on short stack for all of Day 3 after enjoying some time in the chip lead on Day 2. He made his final stand by shoving preflop with and Rubie called with pocket deuces. Gregg never improved his hand and exited in fourth place. During three-handed play Timothy Adams scored a sick double up. Adams opened for 48,000, Brendon Rubie raised to 112,000 and Adams called. The flop came , Rubie checked, Adams bet 201,000 and Rubie check-raised to 976,000. Adams tank-shoved and Rubie called. Adams held and Rubie had . The board completed and Adams took the chip lead. 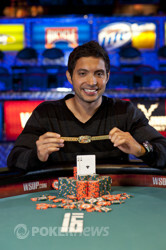 The third place finisher was determined when Adams and James Schaaf each put 48,000 in preflop and the board came . Schaaf check-called the flop and the came on the turn. Both players checked to the river. Schaaf bet 175,000, Adams put him all in and Schaaf called. Schaaf tabled pocket fours but Adams had him beat holding pocket tens. Heads up play covered three levels of action and it was a slow affair. Rubie and Adams traded small pots back and forth, mostly min-raising or betting twice the minimum. Rubie went deep into the tank. Rubie called after a few minutes, only to face bad news. Rubie tabled and Adams held . The fell on the river, shipping the match and the bracelet to Adams. Timothy Adams conquers the field and beats Brendon Rubie heads up to claim the gold bracelet in the No-Limit Hold'em - Four Handed event. Brendon Rubie opened for 80,000 on the button and Timothy Adams made it 225,000 to play. Rubie called and the flop came . Adams bet 255,000 and Rubie called. The turn came and Adams moved all in. Rubie spent a good amount of time in the tank. He mumbled, "I have king queen. Do you have ace jack or something?" After a little while longer in the tank Rubie announced a call. Adams was in the lead but had to dodge a king to clinch the win. The river fell and Rubie was eliminated. Timothy Adams opened to 80,000 on the button and Brendon Rubie three-bet to 230,000 from the big blind. 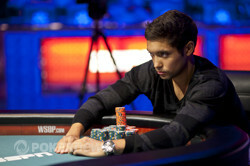 Adams came back over the top with a four-bet to 380,000, Rubie called, and a flop hit the board. Both checked to see the turn where Rubie bet 300,000. Adams gave it up after about 30 seconds. The two remaining players are taking their time. Usually a three-bet preflop will take down the hand. We're not seeing too many flops. We've buckled down, put on another pot of coffee and are ready for the long haul. Brendon Rubie raised to 80,000 on the button and Timothy Adams defended his big blind. The flop came down and Adams checked. Rubie bet 80,000, Adams called, and the landed on the turn. Both checked through to the river where Adams bet 160,000. Rubie mulled it over for about 30 seconds before he called. Adams tabled for queens and fives. Rubie mucked, giving the pot to Adams. Since play has resumed, the players have played a few small pots. Timothy Adams has added a little bit to his lead.